We limit the rate of web page requests that can be made by individual users in any given time period. Your web page requests have exceeded these limits and your access has been temporarily disabled. We impose these limits to protect the web site from automated programs, as part of our efforts to promote fair access to tickets. Please allow several minutes and then try again. Huh? Are bandwidth and server cycles so expensive now that you can't run a small little query against your database for shows in my zipcode during a particlar date range? How pathetic is this? If you are going to install a filter like this make sure you get it right. It's the sort of annoying thing that just eliminates any chance of me ever being a customer of Ticketmaster in the future. Come on guys! 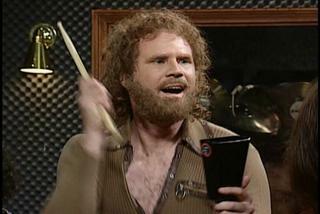 I gotta have more cowbell.